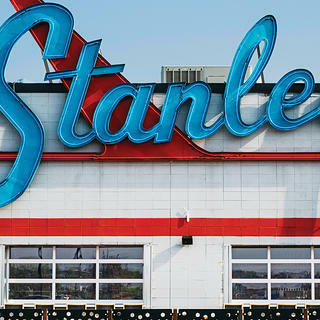 Like so many great things, Stanley Marketplace started with a desire for beer. It was 2013, and Mark Shaker was chatting with his neighbor in the alley behind his house in the Stapleton area of Denver. “There’s nowhere for us to hang out in our neighborhood,” he lamented. If only, he thought, we had a beer hall. Shaker, a former social worker who holds an MBA from the University of Denver, had spent the previous three years as CEO of the nonprofit Worldwide Fistula Fund, overseeing the building of a hospital in Niger. If owning a beer hall had never been part of his vocational plan, neither had creating a project that would connect disparate corners of his community and save—and reinvent—a historic building. But that’s what happened with Stanley Marketplace. Shaker’s offhand comment led to a food hall, shopping hub, recreational destination, and, yes, a beer hall—all of which fill a landmarked 140,000-square-foot former factory building just over the border between Stapleton and the adjacent city of Aurora. 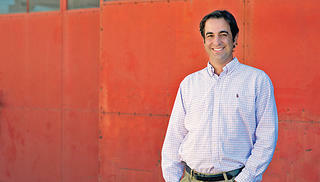 Mark Shaker, whose wish for a beer hall turned into the creation of the Stanley Marketplace. When I visit on a random Tuesday morning in March, the place is hopping. 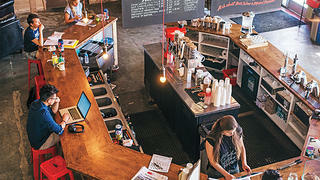 People—often with their dogs—are hanging out in the public areas, sipping lattes and working on laptops. Kids and their parents patronize the early learning center or the gymnastics studio. Two middle-aged men are meeting over barbecued brisket to talk about how to be better Christians. It just seems like a happy place. To understand the importance of Stanley Marketplace, one must understand the two neighborhoods that straddle it. The two-story concrete block building is located in Aurora, which borders Denver and is the third-largest city in Colorado. With a population of about 367,000, it has a Zillow median home value of $318,300. Aurora is represented on one side of the Stanley building by a neighborhood of well-tended midcentury, single-story, single-family houses. On the other side are newer houses built on the site of the Stapleton International Airport, which closed in 1995 and was adjacent to the Stanley building. This is the Stapleton neighborhood (pop. 26,600), which spans the border between Denver and Aurora. It’s a bastion of New Urbanism with idyllic streets of close-set single-family homes with porches. But much of the retail in the area is concentrated in strip malls. The Zillow median home value in Stapleton is $588,700, though there is some affordable housing for sale. But, much like the part of Aurora that abuts the Stanley building, it was a walkable neighborhood without a lot to walk to. 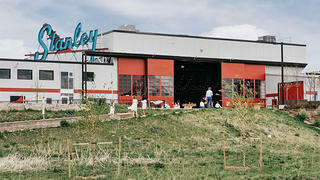 Between Aurora and Stapleton stood the Stanley Aviation Corporation building. Founded by Robert Stanley, the company designed and manufactured aircraft equipment, such as ejection seats for military planes. (Famously, or infamously, Stanley used live bears to test the ejection seats.) The factory was built in 1954, taken over by the Eaton Corporation in 2005, and vacated in 2009. “Everyone in Aurora had a brother or uncle or cousin who worked there,” says Shaker, who is originally from Chicago. But the Stanley building had been empty for years. There it sat, six blocks from Shaker’s house, as he pondered a location for his beer hall. Even he didn’t know what it was. “It just looked like an abandoned building from here,” he says. The building’s former hangar now serves as an event space, providing an additional income stream. Shaker spent nine months thinking about the project, partnering with a friend from graduate school, Megan Von Wald, and her husband, Lorin Ting, on a business plan. He also consulted with Denver chef Kevin Taylor, who, after walking the area with Shaker and hearing his vision, became a partner. Trying to drum up local support for his project, Shaker presented the idea for a family-friendly beer hall at a Stapleton community meeting, to mass approval. An article about the presentation in a local paper, The Front Porch, caught the eye of Tim Gonerka, who works on retail development for the city of Aurora. Would Shaker and his partners be interested in Stanley, Gonerka asked? They would. Except that a beer hall would only take up a small portion of the space. And Stanley wasn’t on any major roads. There would have to be a significant draw—something bigger than beer. Luckily, word had gotten around that Shaker and his partners were eying the Stanley building, and local businesses began calling him up. Denver-based Kindness Yoga asked if they’d be able to lease 5,000 square feet. A fitness company called Endorphin inquired about space, as did Rosenberg’s Bagels & Delicatessen and Comida restaurant. “I had six or seven legitimate businesses that had other operations calling me, and this was before we even had the place under contract,” Shaker says. Denver already had a successful food hall, The Source, and places such as New York City’s Chelsea Market and San Francisco’s Ferry Building Marketplace were “proof that this kind of model could work,” he adds. The partners put in a bid for $2.6 million but were outbid by a gym equipment manufacturing company. So Aurora’s mayor at the time, the late Steve Hogan, got on the line with the sellers. “He said, ‘We’ve got a guy with an idea that is going to not just generate sales tax and renovate an old building, but also help us kick-start development in this area,’” Gonerka recalls. The sellers agreed, on the condition that Shaker’s group match the $2.75 million all-cash bid and that the city of Aurora guarantee the contract—if it fell through, the city would have to make good on it. Aurora said yes. Shaker’s group raised the money, and closed on the building in August of 2014. They brought on another partner, White Construction Group, which had expertise in historic preservation and adaptive reuse. But the bigger question remained: If they built it, who else would come? And just as important: How could the occupants help fill a void felt by each community and act as a connector between them? 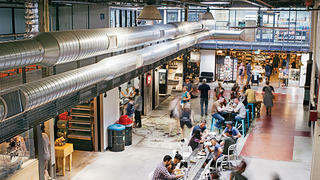 An existing concrete floor and exposed ducts recall the building’s industrial history. Shaker, with his social work background, was well suited to connecting constituencies and balancing the competing needs of multiple stakeholders. “I really enjoy trying to solve complicated problems,” he says. Community desires tended to fall along two lines. People from Stapleton wanted a place to hang out. Folks from Aurora wanted that, too, but they also wanted jobs. It all congealed thanks to some masterful wordplay from Bryant Palmer, Shaker’s brother-in-law and Stanley Marketplace’s self-designated “chief storyteller.” Palmer wrote something he called “The Stanifesto.” It reads, in part, “We are a community of like-minded businesses and people who believe in doing things differently: sustainably, thoughtfully, creatively, with way more than the bottom line in mind ... We believe in making connections: between neighborhoods and generations and strangers and friends.” The Stanifesto encourages honoring the site’s history, taking care of others, putting goodness into the world and (naturally) making the best marketplace in the universe. Patrons relax at the Logan House Coffee Company. It attracted most businesses but repelled some. “You could tell pretty quickly who was and wasn’t interested,” says Palmer. In December of 2015, the team brought on yet another partner to help pay for the renovation and assist with project execution, selling a 50 percent share to developer Westfield Company, which will soon create multi-unit housing in what was once part of the parking lot. The place was 100 percent leased before the $31 million construction project even began. It had several iconic features: enormous neon Stanley signs, a bright red stripe of paint around the industrial gray shell, and huge hangar doors. People didn’t want any of those things to go away. Meanwhile, Shaker became enamored of Stanley’s history, discovering that Robert Stanley had become the first American to fly a jet aircraft in a 1942 test flight for Bell Aircraft Corporation. He had also made many contributions to the aviation and aerospace industries, including pioneering downward ejection seats for the B-52 and other aircraft; automatic-release safety belts; escape capsules for supersonic aircraft; and the Yankee escape system, which was credited with saving lives during the Vietnam War. Haugen and others met with Liz Boyer, then the historic preservation specialist for the city of Aurora, who helped them prepare the application. In 2015 Stanley was approved as the city’s 27th landmark, found to be “significant for its founder, for its contribution to military history, and for its architecture as an industrial example of the International [Style].” Along with the status came $2 million in state preservation tax credits. Danielle Van Ede at her boutique, Sterre. They left as many elements of the original building as they could: the red safety line along the polished concrete floors, an old guard shack, a crane that hangs from the ceiling of Comida restaurant. Stanley Marketplace contains 54 businesses in all, including salons, a dentist, a Pilates studio, boutiques, a co-working space, an urban winery and taproom, and lots of really good food. There’s a waitlist for commercial space, with new inquiries every week. Van Ede says her store is a place where “somebody my daughter’s age  or my age could find something that fits everybody’s wallet.” Which sounds very similar to Shaker’s vision for the marketplace itself. A class at Kinesis Pilates. Van Ede worked as her own general contractor, overseeing the installation of a tin ceiling, a white-and-gray pine floor, a beaded chandelier, and gold star wallpaper. She ended up being the very first store to open. The question of how well it meets its goal of appealing to both Stapleton and Aurora has a murkier answer. Though there are affordable goods at Stanley Marketplace, it still feels in places as if it were lifted from the long-gentrified streets of Brooklyn (though there are more dogs and stylish outerwear here than in New York). As the mayor predicted, more development is now happening near Stanley, including at least two mixed-use projects. Shaker says the marketplace has created 500 jobs and that 30 percent of sales come from the Aurora zip code. Home prices have soared, he notes, in northwest Aurora. This isn’t a positive for everyone, though—homeowners may benefit from the rise in property values, but not renters, and not people of limited means who want to move there. Still, Shaker is committed to being inclusive. The old hangar is now an event space that can be rented out, but also holds free programs and workshops. And he has plans for a program that helps people from low-income neighborhoods develop their business ideas. His good intentions seem real. One thing that is undoubtedly a permanent success is the awareness raised about the Stanley Aviation history that Shaker and his partners have saved. But the project also introduces the concept of historic preservation to an entirely new audience-—people who never would have thought an old factory building could be part of the paradigm, and for whom preservation meant freezing something in time, not adapting it for modern use. Lisa Selin Davis’ most recent piece for Preservation was on Double Ditch State Historic Site in the Spring 2018 issue. She lives in Brooklyn, New York.